In case you haven’t heard yet, with the recently announced Mesa 12.0 release, Intel gen8+ GPUs expose OpenGL 4.3, which is quite a big leap from the previous OpenGL 3.3! The Mesa i965 Intel driver now exposes OpenGL 4.3 on Broadwell and later! 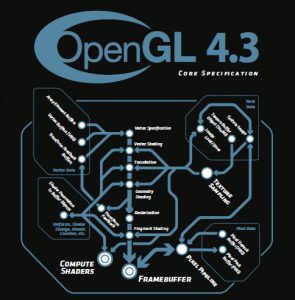 Although this might surprise some, the truth is that even if the i965 driver only exposed OpenGL 3.3 it had been exposing many of the OpenGL 4.x extensions for quite some time, however, there was one OpenGL 4.0 extension in particular that was still missing and preventing the driver from exposing a higher version: ARB_gpu_shader_fp64 (fp64 for short). There was a good reason for this: it is a very large feature that has been in the works by Intel first and Igalia later for quite some time. We first started to work on this as far back as November 2015 and by that time Intel had already been working on it for months. I won’t cover here what made this such a large effort because there would be a lot of stuff to cover and I don’t feel like spending weeks writing a series of posts on the subject :). Hopefully I will get a chance to talk about all that at XDC in September, so instead I’ll focus on explaining why we only have this working in gen8+ at the moment and the status of gen7 hardware. The plan for ARB_gpu_shader_fp64 was always to focus on gen8+ hardware (Broadwell and later) first because it has better support for the feature. I must add that it also has fewer hardware bugs too, although we only found out about that later ;). So the plan was to do gen8+ and then extend the implementation to cover the quirks required by gen7 hardware (IvyBridge, Haswell, ValleyView). At this point I should explain that Intel GPUs have two code generation backends: scalar and vector. The main difference between both backends is that the vector backend (also known as align16) operates on vectors (surprise, right?) and has native support for things like swizzles and writemasks, while the scalar backend (known as align1) operates on scalars, which means that, for example, a vec4 GLSL operation running is broken up into 4 separate instructions, each one operating on a single component. You might think that this makes the scalar backend slower, but that would not be accurate. In fact it is usually faster because it allows the GPU to exploit SIMD better than the vector backend. The thing is that different hardware generations use one backend or the other for different shader stages. For example, gen8+ used to run Vertex, Fragment and Compute shaders through the scalar backend and Geometry and Tessellation shaders via the vector backend, whereas Haswell and IvyBridge use the vector backend also for Vertex shaders. Because you can use 64-bit floating point in any shader stage, the original plan was to implement fp64 support on both backends. Implementing fp64 requires a lot of changes throughout the driver compiler backends, which makes the task anything but trivial, but the vector backend is particularly difficult to implement because the hardware only supports 32-bit swizzles. This restriction means that a hardware swizzle such as XYZW only selects components XY in a dvecN and therefore, there is no direct mechanism to access components ZW. As a consequence, dealing with anything bigger than a dvec2 requires more creative solutions, which then need to face some other hardware limitations and bugs, etc, which eventually makes the vector backend require a significantly larger development effort than the scalar backend. Thankfully, gen8+ hardware supports scalar Geometry and Tessellation shaders and Intel‘s Kenneth Graunke had been working on enabling that for a while. When we realized that the vector fp64 backend was going to require much more effort than what we had initially thought, he gave a final push to the full scalar gen8+ implementation, which in turn allowed us to have a full fp64 implementation for this hardware and expose OpenGL 4.0, and soon after, OpenGL 4.3. That does not mean that we don’t care about gen7 though. As I said above, the plan has always been to bring fp64 and OpenGL4 to gen7 as well. In fact, we have been hard at work on that since even before we started sending the gen8+ implementation for review and we have made some good progress. Besides addressing the quirks of fp64 for IvyBridge and Haswell (yes, they have different implementation requirements) we also need to implement the full fp64 vector backend support from scratch, which as I said, is not a trivial undertaking. Because Haswell seems to require fewer changes we have started with that and I am happy to report that we have a working version already. In fact, we have already sent a small set of patches for review that implement Haswell‘s requirements for the scalar backend and as I write this I am cleaning-up an initial implementation of the vector backend in preparation for review (currently at about 100 patches, but I hope to trim it down a bit before we start the review process). IvyBridge and ValleView will come next. The initial implementation for the vector backend has room for improvement since the focus was on getting it working first so we can expose OpenGL4 in gen7 as soon as possible. The good thing is that it is more or less clear how we can improve the implementation going forward (you can see an excellent post by Curro on that topic here). You might also be wondering about OpenGL 4.1’s ARB_vertex_attrib_64bit, after all, that kind of goes hand in hand with ARB_gpu_shader_fp64 and we implemented the extension for gen8+ too. There is good news here too, as my colleague Juan Suárez has already implemented this for Haswell and I would expect it to mostly work on IvyBridge as is or with minor tweaks. With that we should be able to expose at least OpenGL 4.2 on all gen7 hardware once we are done. So far, implementing ARB_gpu_shader_fp64 has been quite the ride and I have learned a lot of interesting stuff about how the i965 driver and Intel GPUs operate in the process. Hopefully, I’ll get to talk about all this in more detail at XDC later this year. If you are planning to attend and you are interested in discussing this or other Mesa stuff with me, please find me there, I’ll be looking forward to it. Finally, I’d like to thank both Intel and Igalia for supporting my work on Mesa and i965 all this time, my igalian friends Samuel Iglesias, who has been hard at work with me on the fp64 implementation all this time, Juan Suárez and Andrés Gómez, who have done a lot of work to improve the fp64 test suite in Piglit and all the friends at Intel who have been helping us in the process, very especially Connor Abbot, Francisco Jerez, Jason Ekstrand and Kenneth Graunke.